I see that our home game against County has now been re-scheduled for the Friday 15th March with a kick off time of 19.05. TV rules again. So has our away game against Partick the following week also with a 1905 kick off. What's the obsession with this bizarre kick off time? I guess it allows a programme to start at 19.00 with a brief setting the scene and team line ups before kick off and then to end the programme at 21.00. It's all about tidy scheduling. Is this the new bbc set up with live games from the championship on Friday nights ? I love this idea. There is an article on it on the bbc website about more championship games being shown on a Friday night. An inconvenience but more exposure and more money for the Championship in general and ICT in particular is Probably, on balance, to be welcomed. You wonder how Football clubs survived back in the day when the only game shown live was the Scottish cup final. League games should be 3pm on a Saturday with the odd night game thrown in not the other way around. Our attendances are getting alarmingly worrying as it is wihout playing on a ludicrous night at a stupid kick off time. It will be interesting to see how much the club gets from this new channel per game. more likely to be a lump sum added to the championship prize money pot and shared based on finishing position just like the premiership. 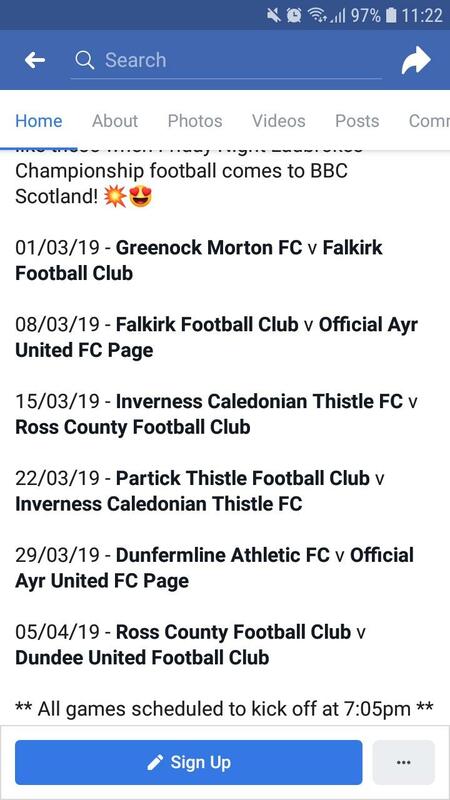 Maybe all those moaning about it could just record it on the Friday night, then sit down at 3pm Sat to watch it and to make them feel better send the £22 that they haven't spent to the club as they are worried that it will suffer. The clubs have all agreed to this including ICT - lets not forget that. I'm assuming this is a fishing trip? Hmm, if people watch the championship on tv it may be more likely to put them off going to watch a game in person. Sounds like we are just following the lead of our cousins down south...Not only do we copy the names of their top leagues but we are doing the Friday night football too. It's a pain in the arse for some because of the fact it has changed and plans may be already in place. Personally I quite like the Friday night games under the floodlights. Not being a school night means I can take my daughter too and it frees up the weekend to spend with my family. However it's not so good if like for the Partick game the teams are far apart but for County it works well imo. I don't have a problem with Friday games either really just prefer it if they are played at a more normal time and the fans know well in advance so they can make arrangements to get to games. Exfeckinactly - I have booked in for the Saturday and Sunday and that is now fooked. Which helps attract sponsors and advertisers. Problem is though its at the expense of loyal fans. I agree. It's a difficult compromise but the brutal bottom line is that we are barely attracting two thousand fans when games are played at three o'clock on a Saturday and the modest amount we still get from the TV companies is what keeps us, just about, viable as a full time club. What modest amount is the club going to get? Too modest to mention it's figure.